GDrive Pro SSD with Thunderbolt 3 technology lets you edit multi-stream 8K footage at full frame rate, quickly render VR projects and experience them at full resolution, and transfer as much as a terabyte of content in seven minutes or less. 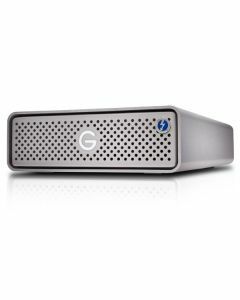 Equipped with scorching fast transfer rates, the G-DRIVE Pro SSD device with Thunderbolt 3 technology lets you edit multi-stream 8K footage at full frame rate, quickly render VR projects and experience them at full resolution. Transfer rates up to 2800MB/s deliver the maximum speed Thunderbolt 3 has to offer so you can natively edit footage in real-time, or transfer as much as a terabyte of content in seven minutes or less. Up to 7.68TB of Enterprise-class SSD storage with a one drive write per day (DW/D) endurance rating give you long-term sustained performance and enhanced reliability for all your demanding workloads. Backed by a 5-year limited warranty, you can be confident in the reliable storage of the G-DRIVE Pro SSD for years to come.